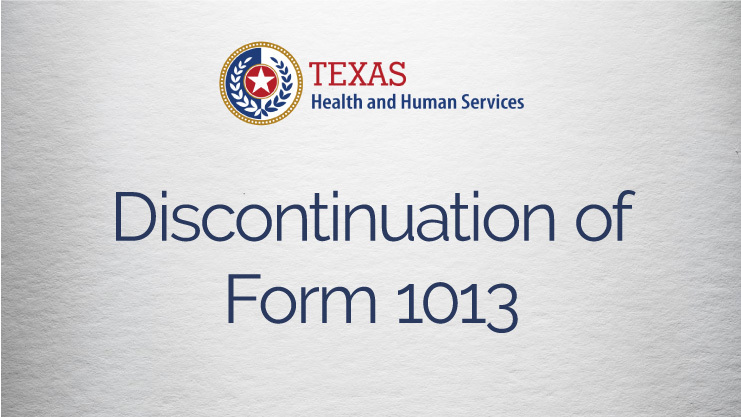 Attention Texas Providers: On our Texas PASRR update webinar yesterday, Texas Health and Human Services (HHSC) made an important announcement about the discontinuation of Form 1013. Form 1013 is used when the nursing facility wants to change a negative PL1 that has already been submitted. The HHSC Intellectual and Developmental Disability (IDD) PASRR unit is responsible for reviewing, approving or denying requests to change a negative PL1 to a positive PL1. The 1013 Form was developed a couple of years ago to assist NFs with resident reviews when new diagnosis for MI and IDD were noted. Recently, there has been an increase in the number of 1013 Forms submitted for review. There are various reasons for the increases and we are in the process of reviewing those factors with HHSC staff. We are giving guidance to stop the submittal of Form 1013s to HHSC effective May 31st. This is the last day we will accept the forms. Any forms faxed to us will be returned to the NF. After May 31st, NFs should complete new positive PL1s for cases where IDD is discovered and the PL1 is negative. NFs should also complete a new positive PL1 for cases where MI has been discovered and the PL1 is negative. Dementia without a MI diagnosis does not require a positive PL1 as it is not a MI. Please note that a review should be done to ensure that the PE has not been done for the condition before you submit a new PL1. Example: PL1 is negative for IDD. HHSC and the LIDDA noted that IDD should have been identified and a positive PE was submitted for IDD. If the NF submits a positive PL1 after this, the PE will be inactivated and services delayed. It is important to always check the PL1 for any associated PE. Please contact PASRR at PASRR.Support@hhsc.state.tx.us if you see a PE already in the system to discuss before you enter a PL1. There use to be a list of diagnosis that would determine who would be a level 2. I am unable to find the list….Do you know where to find this list of diagnosis? Hi Larounder — Your best bet is probably to contact the Texas PASRR support team at: PASRR.Support@hhsc.state.tx.us.